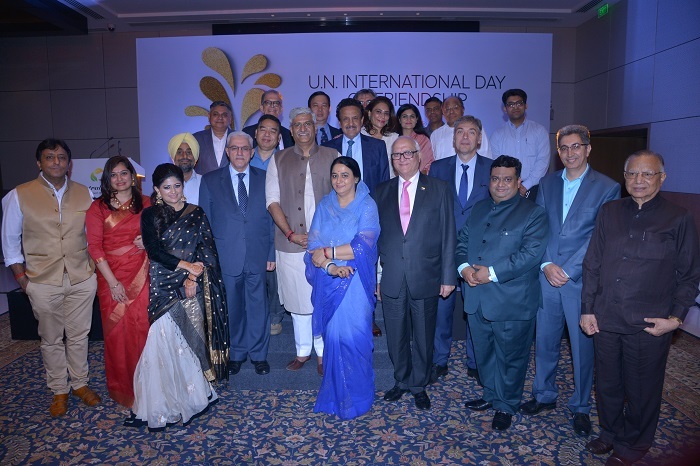 Central Park, a leading real estate developer in the Delhi/NCR region, recently celebrated UN International Friendship Day by hosting a gathering for distinguished members of the international community, government officials and HNIs at The Oberoi, New Delhi. Central Park, a leading real estate developer in the Delhi/NCR region, recently celebrated UN International Friendship Day by hosting a gathering for distinguished members of the international community, government officials and HNIs at The Oberoi, New Delhi. Ambassadors and dignitaries from several nations came together for the celebrations. Some of the eminent personalities included Mr. & Mrs. Gajendra Singh Shekhawat (Minister of State for Agriculture and Farmers Welfare); Mr. K.L. Ganju (Consul General Hony. of the Republic of Union of the Comoros); H. E. Hassan Al Jawarneh (Ambassador of Jordon); K.L. Malhotra (General Secretary for India Council for Human Relations); Mr. & Mrs. Amarjit Bakshi (MD, Central Park); Mr. Vineet Nanda (President Sales, Marketing & Customer Experience, Central Park); Parull Mahaajan (Lawyer, Interior Designer & Social Activist); H.E. Petko Doykov (Ambassador of Bulgaria); Mamta Kochar (IRS) among others. Over 200 expats and their families from 21 nationalities have chosen Central Park as their preferred residential address. Central Park has always envisioned to build residential communities that are at par with international standards and offer peace and harmony to the residents. Right from curating luxury homes, offering services at par with international standards, a green and clean corridor and no surface transportation policy - Central Park has been speaking the world’s language. "When Central Park was conceptualised, our vision was to create homes that meet international standards, so that everybody including the growing population of expats in India feel at home," said Mr. Amarjit Bakshi, Chairman & Managing Director, Central Park. He further added, "We are honoured that our small gesture of friendship has seen such an overwhelming response from different sections of the diaspora." "Central Park today is one of the fastest growing developers. The goodwill that we have earned in our journey to become one of India’s and soon the world’s most valuable real estate developer couldn’t have been achieved without echoing and practicing international standard of professionalism in delivering our work," said Mr. Vineet Nanda, President Sales, Marketing & Customer Experience, Central Park. Central Park is among one of the leading real estate developers in the luxury residential segment in Delhi NCR, with projects across the spectrum of hospitality and high-end living in Gurugram, Delhi, Noida and Goa. For over 16 years, Central Park has built an unrivalled expertise in creating concept living spaces in the country with planned projects across hospitality, leisure, recreation, commercial and upscale residential developments.